The Beast from the East thwarted my attempt to visit Glasgow to enjoy all the art and culture the city has to offer. The night sleeper from Euston, booked many months ago, was cancelled and from what I heard about conditions on the streets up there, it seems that was a blessing in disguise. So I ended up in a London more akin to Novosibirsk in the Siberian Steppes! Still we had lots of fun and went to several exhibitions which unsurprisingly were almost empty of visitors. Victorian Giants at the National Portrait Gallery had only just opened, so it was fresh and exciting. The exhibition tells the story of how four early photographers successfully bridged the gap between the art of the past and that of the future. We learnt the techniques of this early form of photography and how these artists manipulated the negatives to achieve the effect they desired. Hour upon hour of painstaking work must have gone into the pieces which we admired. At this early stage the photographers concentrated on portrait work and what was most apparent, they liked to record children. The four photographers – Julia Margaret Cameron (1815–79), Lewis Carroll (1832–98), Lady Clementina Hawarden (1822–65) and Oscar Rejlander (1813–75) frequently mixed in the same circles as the Pre-Raphaelites and being very well connected, many of the sitters are well known to us today. Of course Lewis Carroll is more often known as an author rather than a photographer – but the two passions overlap each other. 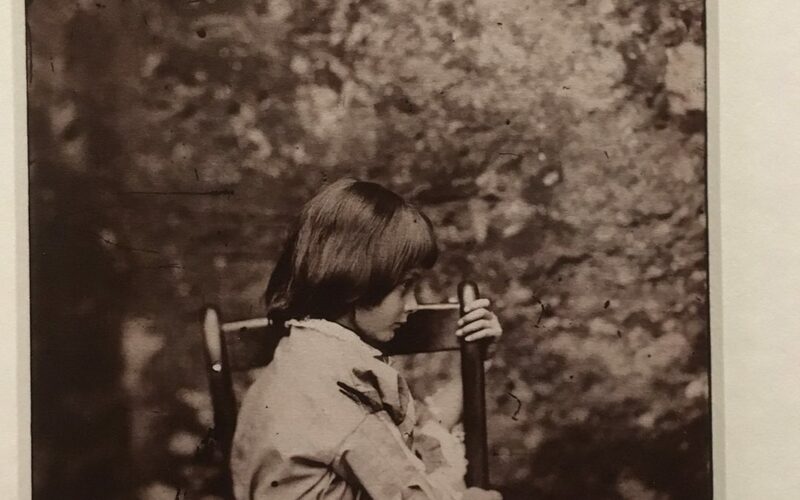 This early photograph, dated 1858, is of Alice Liddell – she was the inspiration for Alice’s Adventures in Wonderland and its sequel, Through the Looking Glass. He didn’t photograph her frequently, only twelve of the portraits out of a total of 2,600 taken by Carroll are of Alice. This particular portrait shows Alice sidelong in full profile – this was unusual for Carroll. It was most interesting to read the contributions made by the Duchess of Cambridge. She chose her four favourite portraits in the exhibition, describing why and what was so important about those ones in particular. This added an extra twist to the exhibition as a whole. It was well worth the visit and most thought provoking – showing a total dedication to this new form of art and experimentation. We are so very spoiled today – our smartphones simply take the pictures for us and then we can tweak the images to enhance and create the desired effect. But this does mean that all of us can enjoy the art of photography rather than just the very privileged few. Photography in the mid 19th century was certainly restricted to the very wealthy who were the only ones who had the time to experiment and the money to produce the desired end result.